The William F. Cribari Bridge has been in the headlines lately. For one thing, its future — replace? repair? rehabilitate? — is very much up for debate. For another, it’s the holiday season — when Al’s Angels’ lovely lights bring smiles to everyone who crosses the span. Even if they’re stuck in traffic on it. Color photography had not yet been invented in 1910 — the year this “colorized” photo may have been taken. But the bridge was already more than 20 years old. And William F. Cribari — the cop who spent years directing traffic at the west end of the bridge, and for whom it was named after his death in 2007, age 88 — had not yet been born. 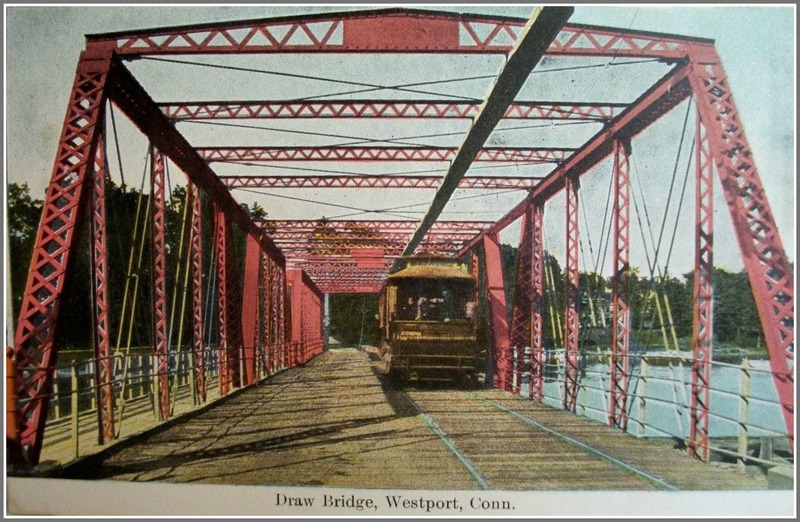 NOTE: The postcard calls it a “draw bridge.” The Cribari Bridge is, of course, a swing bridge. This entry was posted in Friday Flashback, Saugatuck, Transportation and tagged William F. Cribari, William F. Cribari Bridge. Bookmark the permalink. Gorgeous!!! Let’s keep the bridge. It is such a piece of our town history. Super image, Seth. Love the wooden deck detail. Bet it kinda smelled like creosote and hay in the hot sun. Keep the bridge but raise it 4ft! I can’t count the number of fishing poles in the rod holders we broke going under the bridge!